This roasted boneless leg of lamb seasoned with rosemary, lemon juice, dijon mustard and garlic is a succulent Easter delight that truly celebrates Spring. With Easter coming soon, I am re-posting this easy, crowd-pleasing dish from the archives because I LOVE lamb, not just for Easter, but any time of the year. 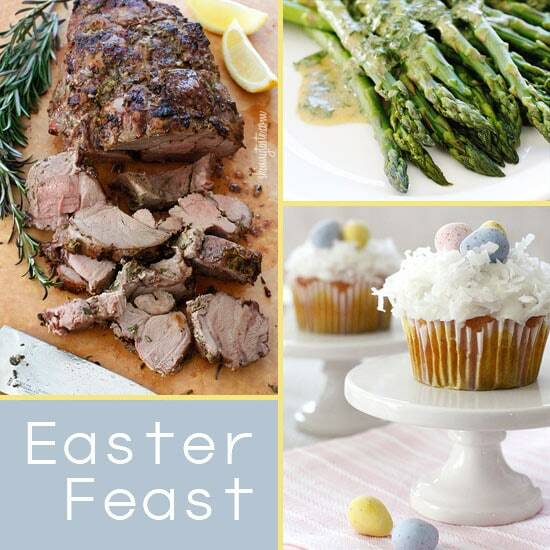 To compliment the lamb, serve it with Teeny Tiny Potatoes with Rosemary and Asparagus with Dijon Vinaigrette for a Skinny Easter Feast, and don’t forget the cupcakes! If rosemary is not your thing, you could use other fresh herbs such as thyme or oregano. Ask your butcher to trim off all the fat for you to make this easier. I like to roll and tie the lamb myself so I can season the inside as well as the out. If you are nervous about doing this, you can just have the butcher do it and just season the outside. Preheat oven to 375ºF. 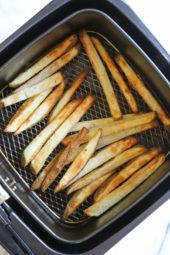 Line a roasting pan with aluminum foil and place a rack in the pan. 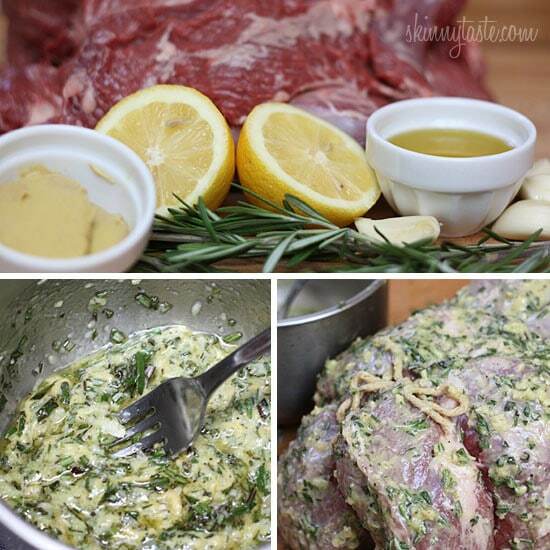 Combine crushed garlic, rosemary, lemon juice, mustard, olive oil, salt and pepper; mix well and rub mixture all over lamb. Roll the lamb and use butcher’s twine to tie it together and place it on the prepared roasting pan. 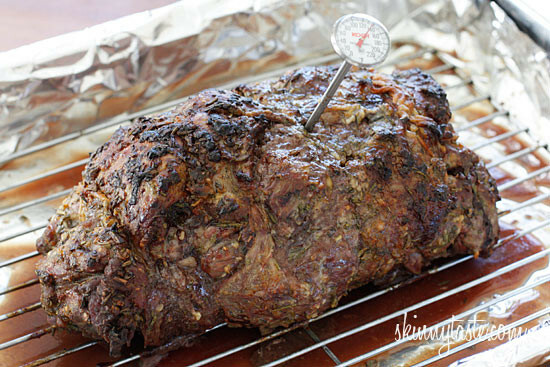 Roast in the oven until medium-rare and a meat thermometer inserted in center reads 135-140ºF, anywhere from 70 minutes and up depending on the size of your roast. Remove the lamb and let it rest about 15 minutes on a cutting board. Keep in mind the temperature will increase a few degrees once it rests. Slice lamb into 1/4-inch thick slices and place on a serving platter. Can. I use spicy brown mustard in place of Dijon? I tried this recipie and it was the best lamb I’ve ever had!! I cannot tell you how easy and absolutely delicious this meal was! I love Dijon mustard and lamb. This is definitely a keeper! Thank you so much for this very tastey recipe!!! Is the nutrition for 4 oz weighed raw or cooked? Thanks! I’m not sure if anyone asked but do you think this can be made in the crockpot? Hi how would you cook this in a slow cooker? Made this at daughter’s request for her birthday meal. It was fabulous. I splurged and cooked it on top of baby potatoes, a couple chunked carrots and 3/4 a red onion, sliced. Thank you, Gina! This was delish but definitely took a while longer to cook. Mine was about 4.1 lbs, after we removed the bone ourselves (not too hard, just messy!). It took almost two hours to get to 140 (I wanted it closer to medium than medium rare). It was worth it though. I didn’t use the mustard, marinated overnight in the garlic/herb mixture and next time would add more garlic/herbs to make up for not using mustard. I also put some potatoes and carrots in the pan, not the healthiest, I know, but so tasty. I also did the separate roasted potatoes and carrots for a healthier option. And we made gravy from the pan drippings, also delish. This is by far the most delicious recipe. Thank you so much for sharing! My 7 and 9 year old devoured the lamb roast. This was amazing and turned out just like your pictures! The trick to a “not so gamey” taste is trimming the fat off and allowing the meat to marinade overnight. I will most certainly be making this again! Great! Glad you enjoyed it and I love that the kiddos liked it too! Making this for Christmas Eve (we’re so tired of turkey). I plan to cook a little longer as I have people that may “freak” if they see too much pink. I am making this tomorrow but have all the ingredients now…is it worth marinating overnight? Is the serving size of 4 oz AFTER its already cooked? Hey Gina! Thanks so much for sharing your recipes. Me and my husband made this last night for 7 people and everyone raved about it!!! ive been known to burn water lol but… – your instructions are easy to follow and your results are undeniable! Thank you for your recipe website. FYI we resently had a baby and I’ve lost 7 lbs just by following your recipes for the last three weeks (my husband lost 10 -_-). Much love to your website.! Made this for Easter, first time cooking lamb myself. It was delicious. I made a smaller one, half boneless leg. Forgot to get fresh rosemary so used dried & crushed it to get more flavor. Everyone raved. Next year I will make the full leg, but I wont wait until Easter to make again. Yum! This is hands down the best lamb recipe. I have been making it for years and share it constantly. Would you recommend this recipe be used in an Instant Pot? I have been cooking lamb for years, and learned from on old Armenian woman to soak my lamb in milk for 24 hours before marinating or seasoning and cooking. It makes it so tender and delicious with no gamey taste at all!! The pictures look deliciousI am making this for my mom, sister, and daughter for Mother's Day! I made this tonight for Easter dinner. It was my first time making lamb and I nailed it thanks to your recipe! Your photo is beautiful, but I think your finished cooking temperatures are off. If you want medium-rare lamb, you'll need to remove the meat from the oven at about 130º. 135º will give you medium lamb, with almost no pink. As it stands after removing it from the oven a big piece of boneless meat will continue to cook. Lamb is WONDERFUL eaten rare to medium rare. I first had it served rare in France, and I think the reason so many Americans eschew lamb is that its so often served overdone here. While I prefer having a bone-in (more flavor), I see no reason I cannot use this recipe…..sounds yummy. Very similar to my usual Easter leg of lamb recipe…. Would this marinade work on chicken or pork tenderloin? Thank you for this marvelous Easter dinner menu…! Never trim the fat off the meat. it is the best part of lamb! I've never eaten lamb in a while! This looks wonderful! I was wondering if it is possible to make this in a slow cooker? I live in a studio apt with no oven so I often use the slow cooker for recipes that would normally require an oven. Thanks for your input. Whats with all the archive recipes lately? Are you out of ideas? This looks absolutely delicious! I can't wait to try this. It has a surprisingly fast prep / cook time. I have been wanting to get into lamb but have never cooked with it before, but I'm definitely going to give it a shot. I just randomly Googled today and found this recipe when figuring out what to do with a leg of lamb I picked up for Christmas dinner. It was GREAT. Thanks!! I don't have a roasting pan can I maybe put it in a dutch oven? Never trim the fat off the meat – it is the best part of lamb! Do you need to place the lamb on rack in oven or can I just cook straight on a regular pan? What if it had to be grilled because, where I'm going for easter, the oven does not work? Would it be ok grilled? If so, at what temp do you take the lamb off the grill?? To grill (smoke) on grill is the best.keep in mind,low and slow is the way to go when smoking lamb. Temp should be 225/250. Smoke time will run about 7-8 hrs. Wrap in foil the last few hours and allow grill to cool. Enjoy. I'm pretty sure I love you…this looks fantastic and is the answer to my Easter dinner woes. Thanks for all the great recipes- I am almost exclusively cooking from your recipes and doing weight watchers which means I am losing pounds and feeling great while eating delicious food! Ive made this over and over… Simply amazing! I made this tonight, it was amazing!!! very delicious rub and such an easy recipe! but isn't 130-140 a little rare for leg of lamb? i thought so, but gave it a shot and it was completely raw. put it back in until 160 and it was great. thoughts? It's really a matter of how well you like your meat cooked. Keep in mind it needs to rest and continues to cook about 5 degrees, but if you like it more well done then yes I would leave it longer. We made this over the weekend, and it was delicious! Instead of rolling and tying it, we left if as is and threw it on the grill – fabulous and easy! We were surprised at how flavorful each bite was since we only marinated it for a couple of hours. Thanks Gina! I could only find lamb with the bone. It is 5.5 lbs. How long and at what temperature should I cook it? Ask your butcher to remove the bone. This was simply delicious.I put chicken broth at the bottom of the pan and used the drippings to make a sauce by adding cornstarch. Served with mashed potatoes/cauliflower/carrots and everyone licked their plates. Thanks for sharing. I also marinated the lamb overnight. what did you marinate the lamb in overnight???? I used this recipe on a 5lb semi-boneless leg of lamb and it was easy and delicious. Made this today for very fussy parents and in-laws and it was fabulous. Only my second time making lamb. Thanks for saving me with this easy and delicious recipe. I made this for dinner tonight and it was very good, but I think it could have been better. It was pretty red in the center of our meat, even at 135 degrees, and waiting 15 minutes to cut into it. Can you tell from this picture, did it need to be cooked longer? http://imgur.com/vEkV5 Or is lamb just not very tender in general? you had your oven too hot . Was thinking of making this tomorrow but then went on a tangent…. How do you think this would be using the spread from your recent salmon recipe (Dijon, garlic, herbs de Provence, vinegar…) ? Kept seeing lamb recipes and this one made me decide to finally try my hand at lamb! Ordered from butcher this morning! How far in advance can you put the rub on? I ended up putting the rub on the night before without the salt, and salting right before I put it in the oven. Took it out at 135 and it was PERFECT!! Everyone loved it! Another one of my Grannies dishes! I have never made it- but am going to have to attempt it. Her's was so garlic-y & soooo good. This looks wonderful! My husband does not like rosemary, however. Can you suggest another herb to use as a replacement? I am going to cook this tomorrow for a group of friends as our annual friend Easter Dinner before we all get busy with our families. I have one person that isn't all that fond of Rosemary… I'm not sure I want to skip it all together but what would you think a fresh spice blend of Rosemary, Oregano, and Thyme would be like? Would that be too over powering?? I'm sure it would be great! 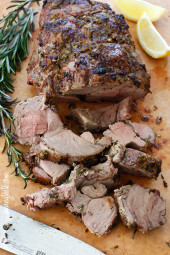 Just bought my first leg of lamb and so happy to see today's recipe…now I know how I will cook it this Sunday! My is bone in though…will that make a difference? I have NEVER cooked lamb because I thought it would be gamey, as it was the ONE time I've tried it. But this looks so delicious & easy I have to try it out on Easter. It will just be my husband and me this year so a good time to try a new recipe. BTW I love your website! I'm so glad I found you on Pinterest! I have to say, I NEVER seen Leg of Lamb look so good. I actually have never had it, but looking at your photo, Wow!!! Everything looks so good! Hi Gina, yet another fabulous recipe and photo that makes you want to just climb through your computer .. or lick your screen although I tend to avoid the latter lol .. quick question.. did your lamb come out of the oven that crusted ?? Or did you use any techniques before pictures ? Such as maybe a torch ? ohh I can only hope for the same results then!! It looks delicious! Sounds delish, except for the Rosemary. not a fan of that herb. Can I substitute a different Herb? I have always been too intimidated to cook lamb myself. This looks so good though, I have to try it out. Thank you for the recipe! My Mom and Grandma used to make lamb but after mom saw a real one she stopped cooking it !!! The last time I had a great lamb was at dinner in the Twin Towers in NYC. It was great ! Thaks for the recipe. I may just try it on my family or I'll be eating lots of left overs. I had a delicious venison in the twin towers! Memories! I had a delicious qual dish in the Twin Towers! Thank you for this recipe. It looks absolutly delicious and I can't wait to try it!! Happy Easter! Wow Gina … this is my mother's recipe from my childhood, sans the lemon juice! 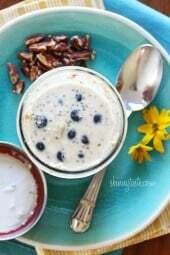 So even without trying this recipe, I can tell you it is AWESOME! One of my all-time favorite meals! I think my mom's is similar to yours. Your photos are amazing. I only eat fish/chicken/turkey but once a year I will have leg of lamb for Easter. Have a wonderful Easter Gina! Thank you for this recipe! We usually have ham for Easter, but this year I bought a leg of lamb not knowing how to prepare it. This recipe sounds easy and delicious. Thank you! This looks fantastic! I was contemplating making either this or your rack of lamb w/ Dijon glaze this weekend. I noticed the only difference is the agave nectar and the balsamic vinegar. What's the difference in taste? Could you use either marinade for the leg of lamb?? Love,love,love your website! Extremely easy to navigate, and very pleasing on the eyes. Great photos, recipes and easy to follow instructions. I've already have the ingredients for 3 of your recipes this week and made the Asian Turkey Meatballs w/ Brown Fried Rice last night and we all loved it. Will definately be using this site weekly. Thanks for a great website with healthy cooking!! What a mouthwatering leg of lamb! This looks so delicious, Gina. Looks like you have a wonderful Easter feast planned. Thanks for sharing! This is perfect! I love it! 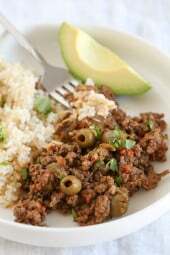 I have been searching for a good recipe for lamb that didnt center around lemon as my husband isnt a fan of too much lemon. Thank you for our Easter dinner recipe! OMG! That looks sooooo good. I've never been able to make lamb work but I will have to try this. I'm not hosting Easter this year, but I will definitely be making this, maybe next Sunday!! I love Lamb, it's great anytime in my opinion! Amazing! I just took out a leg of lamb from my freezer. I absolutely love roasted leg of lamb! This will be great for my Easter dinner! Thanks for the post! My mother insists on having a lamb roast every Easter even though with all the other food, it's usually overkill. Gonna try and persuade her to try this one out this year! Could only find lamb leg with bone… how does that change cooking time? Take the bone out. It's not the hard.